The Hour of Land, RadioWest Interview, Doug Fabrizio of RadioWest, KUER, NPR of Utah, interviews Terry Tempest Williams on The Hour of Land, June 1, 2016. Finding Joy and Discomfort in the History of the National Parks, To The Best of Our Knowledge: Terry Tempest Williams on wilderness and her forthcoming book, published November 15, 2015, from Living Dangerously: Live in Utah. Terry Tempest Williams: "Survival Becomes a Spiritual Practice," The author and activist talks with YES! about millennials, climate change, and how she can't imagine being alive at "a more thrilling, challenging time. ", interview by Sarah van Gelder, published on October 5, 2015. A Love That is Wild, Hear Terry Tempest Williams' keynote talk at Bioneers. A Wild Success, The Endangered Species Act celebrated its fortieth birthday. Orion contributing editor Terry Tempest Williams reflects on this major American achievement, and how it continues to shape our relationship with the natural world, published in Orion Magazine on December 31, 2013. An Encore Hour With Terry Tempest Williams: Monday’s Access Utah, aired August 23, 2013, on Utah Public Radio (UPR), listen online. Ground Truthing, Devon Fredericksen interviews Terry Tempest Williams for Guernica Magazine, published August 1, 2013, read it online here in Guernica Magazine. The Rumpus Interview with Terry Tempest Williams, by Roxane Gay, published July 4, 2013, read it online here in The Rumpus. Pandora’s Terrifying Promise: Can Nuclear Power Save the Planet? A conversation about a new documentary, its provocative claims—and the facts it leaves out, by Mark Hertsgaard and Terry Tempest, published in The Nation on June 10, 2013. Terry Tempest Williams interviewed on Travel with Rick Steves' radio program on May 11, 2013. Listen online here. Listen to Terry's interview on When Women Were Birds, on The Story. Interview with Terry Tempest Williams, by Brad Listi, on Other People Podcast, with Terry Tempest Williams, February 17, 2013. Makers: Voices of Utah Women, produced by KUED's Nancy Green, tells the story of the women's movement in Utah through the firsthand accounts of leaders and activists who fought to alter the social fabric of the state. Watch the full video online. An Hour With Terry Tempest Williams: Access Utah Tuesday: Tom Williams interviewed Terry Tempest Williams for UPR, Utah Public Radio, recorded on June 12, 2012, available online here. "Five Rivers, Five Voices," a new film by KUED Channel 7, features a segment on the San Juan River with Terry Tempest Williams. Here's a promo on YouTube, a flier. Read about Terry Tempest Williams' recent visit to the University of Delaware where she spoke on campus as part of the DENIN Dialogue Lecture Series, hosted by the Delaware Environmental Institute. Terry Tempest Williams answers 20 questions on The Reading Room. Hear Terry Tempest Williams speak on "The Vitality of the Struggle" on American Public Media's Being program, from February 3, 2011. The naturalist and writer Terry Tempest Williams offers notions of neighborliness, sacred rage, and beauty as a matter of survival. And she sheds light on the American West as a crucible of American divides and possibilities. Read "This Associative Life: An Interview with Terry Tempest Williams," by Kevin Smokler in the Winter 2009/2010 online edition of RainTaxi. An interview with Terry Tempest Williams by John Sterling, was published in High Desert Journal, Spring 2009 (Number 9). 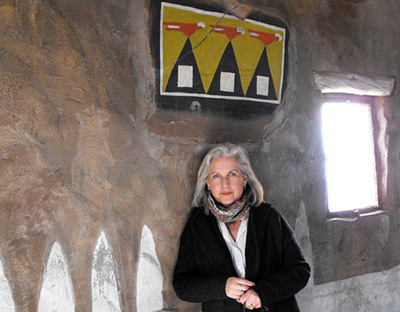 The American Association of Museums published an article entitled "A Place to Be Quietly Subversive" A Conversation with Terry Tempest Williams, in Museum, May/June, 2008. Read it online here. The Progressive features an interview of Terry Tempest Williams, available as a podcast from Progressive Radio, posted on November 5, 2007. Download or listen online here. The article was first published in the February, 2005, issue of The Progressive and the interview is by David Kupfer. Read it online. Listen to a podcast of a conversation between the artist Robert Shetterly and Terry Tempest Williams from radio station WERU 89.9 in Blue Hill, Maine, that played on the audio magazine "Weekend Voices" on June 30, 2007, and was recorded on May 18, 2007. Listen to it here. Read Art as a Spark for Social Change, by Terry Tempest Williams, on the Worldchanging.com web site, published on April 19, 2007, in honor of Earth Day. Terry was one of the Barefoot Artists who accompanied Lily Yeh to Rwanda in 2005 and 2007. Learn more about the Rwanda Healing Project on the barefootartists.org web site. SNEWS Live sat down one-on-one with Terry Tempest Williams following her keynote address at the Conservation Alliance's annual meeting during Outdoor Retailer Winter Market 2007, in Salt Lake City, UT. The topic of the interview was the role that art and poetry can play in creating a life dedicated to conservation and sustainability. The interview is available online as a podcast, posted on March 2, 2007. Terry Tempest Williams was interviewed by Marcia Franklin of Dialogue, a show on Idaho Public Television. Terry was in Idaho to receive the Distinguished Achievement Award from the Western American Literature Association in October, 2006. The program aired on December 28, 2006, is wide-ranging, and you can view or listen to it online from the Idaho Public Television web site. There are several streams and formats to choose from. Voice in the Wilderness: Conversations with Terry Tempest Williams, edited by Michael Austin. Utah State University Press has published a book of interviews entitled A Voice in the Wilderness: Conversations with Terry Tempest Williams, edited by Michael Austin, (August, 2006). Milkweed Editions published Postcards from Ed: Dispatches and Salvos from an American Iconoclast, written by Edward Abbey, edited by David Petersen and with a Foreword by Terry Tempest Williams, in August, 2006. Trinity University Press published Home Ground: Language for an American Landscape, edited by Barry Lopez and Debra Gwartney. 45 poets and writers contributed to this book, including Terry Tempest Williams. "We Leave Our Doors Wide Open," is an inteview with Terry Tempest Williams published on Terrain.org, Issue No. 17 - Fall/Winter 2005, available online here. Wild Side News featured an audio interview with Terry Tempest Williams on "The Open Space of Democracy." The interview is conducted by Sidney Wildesmith, Wild Side News host, and ran September 16, 2004. Read "A Conversation with Terry Tempest Williams," published in Delicious Living Magazine, Wise Words, October, 2003 issue, in which she speaks about a recent trip to the Arctic. Read an interview with Terry Tempest Williams by Tricia Brick, in the Summer, 2003, issue of Etude, New Voices in Literary Nonfiction. Etude is published by the Literary Nonfiction Program at the School of Journalism and Communication, University of Oregon. Read an interview with Terry Tempest Williams entitled "Testimony, Refuge, and the Sense of Place - A Conversation with Terry Tempest Williams," by David Thomas Sumner, in the Spring/Summer 2002 issue of Weber Studies (Volume 19.3). Brief audio interview with Terry Tempest Williams by Melinda Tuhus on Between the Lines, a weekly radio newsmagazine which is part of WPKN radio in Bridgeport, CT, for the week ending July 19, 2002. Terry discusses her bond with photographer Emmet Gowin, the impact of Gowin's images, the American Southwest, downwinders, nuclear testing, the Nevada Test Site, and the necessity of bearing witness. A commentary on Homeland Security and the Fate of Public Lands by Terry Tempest Williams is available on Now with Bill Moyers (PBS) website, March 8, 2002. The full program transcript is available here. "The Politics of Place" with Terry Tempest Williams. A conversation with prize-winning author and naturalist Terry Tempest Williams about the meaning of home, community, and our changing relationship to the land. May, 1995, Santa Barbara, CA. Interview by Scott London, on the website Insight & Outlook. Insight & Outlook was a weekly public radio series which aired on NPR. Full Transcript. Interview entitled "Erosional Spirituality", by Julie A. Wortman, in A Global Witness, which publishes the online magazine, The Witness, April 2001, with great accompanying photos. See a more complete listing of interviews in the Bibliography section.